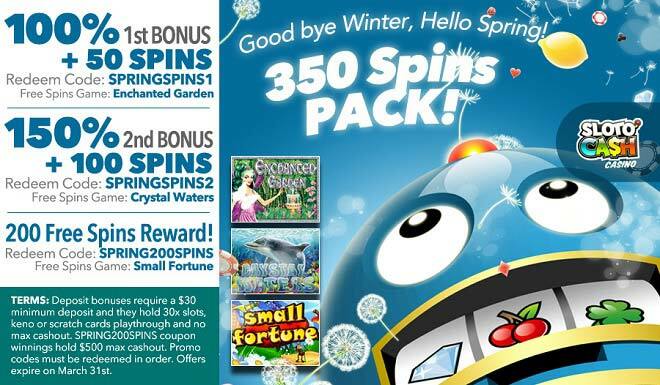 350 Free Spins Pack to Wave Goodbye to Winter and Welcome Spring! The changes in the season mean changes in weather and Mr. Sloto has put away his coat and scarf already! Winter is gone and Spring has brought warmer temperatures and it's time to celebrate this new season with huge winning opportunities when you deposit as little as $30 to play with up to 350 Free Spins! The birds are chirping happily and so will you when you spin our popular Enchanted Garden with a1st Mid March 100% Match plus 50 Free Spins. Winnings will continue to grow with a 2nd Match of 200% and 100 Crystal Water Spins. And more Spring joy will sprout when you claim Mr. Sloto's special 200 Free Spins Reward! Spring is everywhere - and Mr. Sloto calls for a celebration with two rewarding bonuses and 350 Free Spins! Deposit bonuses require a $30 minimum deposit and they hold 30x slots, keno or scratch cards playthrough and no max cashout. SPRING200SPINS coupon winnings hold $500 max cashout. Promo codes must be redeemed in order. Offers expire on March 31st.